With the long run-up to a referendum on Britain’s EU membership underway, and as Greece’s stand-off with the EU institutions reaches a new stage, CLIVE HEEMSKERK looks at how socialists should approach the in-or-out EU debate. How should socialists vote in the referendum on Britain’s membership of the European Union (EU), promised by David Cameron to take place before the end of 2017? At this moment opinion polls show a majority for continued membership. This is particularly so amongst young people, repelled as most workers are too, by the reactionary nationalism of those presented in the establishment media as the voices of No, the right-wing Tories and UKIP. But thirty months is a long time in the ‘age of austerity’ ushered in by the financial crisis of 2007-2008 and the subsequent recession, and events can unfold which could decisively shift mass consciousness. Not least would be a new economic downturn, ending the anaemic ‘recovery’ of the last few years and accelerating centrifugal forces within the EU. The denouement of the Greece eurozone crisis, once it can be fudged no longer, will also have its impact. Neither a ‘Grexit’, whether defiantly led by the Greek government or a chaotic ejection by ‘Graccident’, nor a humiliating capitulation by Syriza parliamentarians to EU-imposed ‘savage austerity’ – with the danger of a new rise of the neo-Nazi Golden Dawn that would precipitate – would bolster support for the EU. So Cameron’s present calculation that he can secure a Yes vote for EU membership while preventing a terminal rupture within the Tory party could easily be wrecked. There could even be a question mark, at that point, as to whether a referendum would actually be proceeded with, despite the formality of a parliament-agreed timetable. Margaret Thatcher, a cold-blooded defender of capitalism, musing in 1975 that referendums were usually the "device of dictators and demagogues", concluded that a government should only ask if it knew the answer. To proceed on the basis of certain defeat – finally confirming Britain in its real position as a second or third-rate world power – would destroy the Tory party. But not to proceed would also shatter the Tories, possibly into different parties, raising the prospect of new parliamentary alignments or an early election. Debates so far in the working class movement have not sufficiently placed the issue of the EU referendum within this context of economic and political perspectives. Nevertheless a programme still needs to be worked out on the basis that a referendum will indeed take place at some point before 2017. 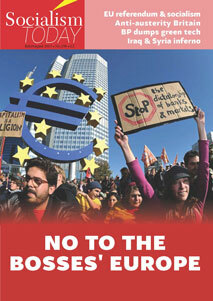 So how should trade unions, anti-austerity campaigners, young people and socialists respond to the in-or-out EU debate? The starting point cannot be one of supporting alleged ‘British interests’ or the equally illusory idea of the ‘ever closer union’ of the capitalist states of Europe, but of supporting the working class against the capitalist class, and the irreconcilable antagonism of their interests, nationally and internationally. The EU, fundamentally, is only an agreement between the different national capitalist classes of Europe, with the aim of creating the largest possible arena for the big European multinational corporations to conduct their hunt for profits with the least possible hindrance. Each treaty, from the 1957 Treaty of Rome that created the European Economic Community (EEC) onwards, has developed and enhanced a Europe-wide market, with pan-European regulations and commercial law. The most recent treaty, signed in Lisbon in 2007 by Gordon Brown without the referendum on EU ‘constitutional change’ promised in the 2005 election, codified into EU law the neo-liberal policies that have dominated world capitalism in the last three decades: privatisation and deregulation, attacks on workers’ rights, and the slashing of pensions, free education and public health services. The EU is now firmly established as an agency of continent-wide austerity. This is not to say that capitalism has been able to create, or is near to creating, a ‘united states of Europe’, as some of the more rabid eurosceptics imagine and also, unfortunately, some on the left. There are powerful pressures in the world economy pushing the national capitalist classes of Europe together, economically and politically, in particular to create a bloc big enough to rival the US, China and Japan. But because of the two pillars on which the capitalist system is based, the private ownership of the means of production and nation states, which are not only economic entities but historically rooted and persisting social and political formations, there remain counter-pressures to the drive for European unity. The essential character of the EU as an agreement between the different capitalist classes of 28 nation states – a far-reaching agreement but by no means permanent – has not changed. It is also true that in EU negotiations aimed at ‘equality of competition’ throughout the single market some environmental regulations, free movement protections and social provisions have been introduced, as a by-product of attempts to resolve conflicts between the capitalist classes of the different nation states. Reliant on lightly-regulated financial services and Britain’s notorious ‘flexible labour market’, and lagging behind Germany and France especially in capital investment, research and development and productivity, the agenda of big sections of the British capitalist class is not identical to that of their ‘EU partners’. But that is no reason for the workers’ movement in Britain to give a vote of confidence – a Yes vote – to the EU. Such questions are not new for Marxists in the workers’ movement. Lenin, one of the leaders of the Russian revolution, argued at the October 1917 congress of soviets to annul the treaties signed by the Tsarist government, while conceding that "the predatory governments… not only made agreements between themselves on plunder" but also included clauses "on good-neighbourly relations… we cannot reject these". (Collected Works, Volume 26, p255) But to defend the interests of the working class, however, the soviets could not "bind ourselves by [the Tsar’s] treaties. We shall not allow ourselves to be entangled by treaties". To annul a treaty, of course, is to say No to it. The neo-liberal core of the EU and its pro-market, anti-worker directives and rulings – compelling the privatisation of public services, prohibiting nationalisation, opening up collective agreements to legal challenge and so on – have real consequences for workers. The working class has to have its own independent position: not the bosses’ EU but a socialist Europe. The reality of EU free market directives – away from seminar debates on ‘constitutional principles of free movement’ etc – was perhaps most starkly revealed in Britain in the February 2009 dispute by construction workers building a new desulphurisation facility at the Lindsey oil refinery in Lincolnshire. Workers employed by the Lindsey contractor Shaw faced redundancy after a contract had gone to IREM, an Italian company. Shaw, as a UK-registered company, had to employ union labour under the terms of the National Agreement for the Engineering and Construction Industry (NAECI). Under the EU posted workers’ directive however, which does not recognise collective agreements between unions and employers, IREM did not. IREM proposed to employ 200-300 Italian and Portuguese workers who would live on barges in Grimsby docks and be bussed in to work. Union stewards tried negotiating but, after IREM refused their demands, recommended to a mass meeting of Lindsey workers at the end of January to stay ‘in procedure’, abiding by the legal position underpinned by the EU directives. The meeting voted instead to take immediate unofficial strike action, igniting spontaneous walkouts of construction workers across Britain. A strike committee was set up and Socialist Party member, Keith Gibson, became one of its main spokespersons. The unofficial strike had started without any leadership or clear demands. The vacuum that existed initially was filled by home-made posters for ‘British jobs for British workers’, mocking a recent speech by Gordon Brown. This slogan was never a demand of the strike but it was used by the media and, unfortunately, sections of the left, to present the strike as racist, even as the far-right British National Party were being kicked off the Lindsey picket line. But by early February the ‘British jobs’ posters had gone, placards in Italian (produced with the help of the CWI) appealed to the Italian workers to join the strike – and the employers had capitulated. Half the jobs were offered to local labour with all workers to be paid according to the national agreement. No Italian or Portuguese workers were laid off and all were now allowed to join the union. Workers had struck back, breaking through the anti-union laws and the EU directives. But Lindsey had showed how the EU directives were a material weapon in the hands of the capitalists, to try and divide workers on national lines and drive through their austerity agenda. While some on the left – many now calling for a Yes vote or abstention in the EU referendum – failed to understand Lindsey, the Rail, Maritime and Transport workers’ union (RMT) gave immediate support and drew the most important political conclusion: workers’ needed their own political voice against the EU. Inviting the Socialist Party and the Communist Party of Britain (publishers of the Morning Star) on board, a ‘political party’ was registered to contest the 2009 European elections – as required under electoral law – under the name No2EU-Yes to Democracy, with RMT general secretary, Bob Crow, as the official leader. Socialists could not participate in an electoral bloc or coalition which made concessions to racist or nationalist prejudices. But that was not the case with No2EU which, while its programme was limited, was at bottom a pro-worker bloc. Its platform included opposition to the EU’s pro-privatisation directives and anti-trade union rulings, and a stand for international workers’ solidarity. While conceived as a temporary platform for the European elections only, it was significant as the first national electoral challenge made by a trade union since a RMT predecessor union helped to form the Labour Party in 1900. It laid the basis for the formation in 2010, again with Bob Crow prominent, of the Trade Unionist and Socialist Coalition (TUSC). Lindsey had brought to wide attention the role of the EU’s anti-worker directives but it had also highlighted another vital aspect: the critical role of the strike leadership, including Socialist Party members, in cutting across any national or racial divisions that could have derailed the movement. The same burning need for a clear lead – for a workers’ alternative – is true today in the EU referendum debate. Can’t the EU be reformed? While the RMT came out in support of the Lindsey workers a letter appeared in The Guardian from Caroline Lucas, then a Green member of the European parliament (MEP), and a couple of Labour MEPs. While accepting that the posted workers’ directive was behind the dispute, "if we are to end ‘social dumping’," they wrote, "we must change the [EU] law… we urge MEPs to join us so that social justice is put before corporate profit" (6 February 2009). This summarises the position of the left advocates of EU membership: why not try and ‘reform the EU’ in the interests of the working class? What is never explained is how this is to be achieved. The supreme political authority of the EU is the European Council, the heads of government of the 28 different capitalist nation states of the EU. Executive functions are carried out by the European Commission whose current president is the Luxembourg conservative politician Jean-Claude Juncker. The directly-elected European parliament of 751 MEPs, while providing a tribune for workers’ representatives like the Irish Socialist Party MEPs Joe Higgins and Paul Murphy and others, is an almost toothless body. Caroline Lucas’s letter spoke of MEPs threatening "to veto this year’s incoming European Commission, unless it agrees to revise the posted workers’ directive". Approving the appointment of the Commission every five years is almost the only power the parliament has. That may be true, the Yes to EU lefts argue, but why not demand more powers for the EU parliament? But why would the holders of those powers – the lead political representatives of the 28 capitalist nation states in the European Council – cede them to another group of capitalist politicians, second-class at that, in the European parliament? The call for power to be concentrated in the European parliament – and even more so for this to be used to defend workers’ interests and take on capitalism – if it is to have any meaning at all, is effectively a ‘programme’ for a simultaneous mass movement across all the EU countries, not to overthrow a central authority but to somehow compel the government representatives of 28 different national capitalist classes to give up their power. There have been parliaments in history – in the English civil war, the French revolution etc – that have been rallying points for a movement of the masses to seize power from an historically bankrupt ancien régime. The revolutions of 1848, for example, saw the Frankfurt assembly attempt to take power from the feudal principalities and city-states loosely connected in the German confederation and create a united Germany. But even then, at a time of capitalism’s rise, and when there was no question that there was a wide German national consciousness behind them, a common language and culture etc, the assembled bourgeois parliamentarians were not prepared to take the revolutionary steps that were needed. Is there any need to draw the contrast with the situation today, with capitalism no longer taking society forward, with no popular movement for a unitary European capitalist state, but on the contrary with a growing mass hostility against the EU and its role in imposing austerity? If the capitalist politicians of the different nation states of the EU have not drafted EU treaties on the basis of ‘social justice before corporate profit’, it is because in the final analysis they represent the interests of their respective capitalist classes. The working class is the only class with no stake in capitalism and whose interests are the same whether they are German, British, Italian, Greek, etc and therefore with an interest in real international solidarity. But if a working class movement can be built across Europe – and that is the task – why limit it to reforming the EU treaties? If it could compel the different capitalist classes of Europe to make major concessions against their interests – and that is not impossible, in a temporary retreat, if the capitalists see their rule under threat – why then should it stop until the capitalist governments of Europe are overturned and a new collaboration of the peoples of Europe inaugurated, a socialist Europe? A socialist united states of Europe, in the first instance probably a confederation of independent socialist states, is the programme of Marxism. But in the meantime movements of opposition to austerity erupt on different national terrains – the Greek crisis, the Irish water charges movement, the Spanish indignados – in the unco-ordinated way that mass movements do. What should socialists say when those movements are confronted with their capitalist national governments waving ‘EU requirements’ at them and denouncing them for threatening ‘the European project’? Days after the Front National won the 2014 European elections in France, its leader Marine Le Pen claimed she had a mandate to demand that president François Hollande nationalise Alstom, the builder of high-speed TGV trains, "contrary to the rules of the European Union, to save this strategic company" (The Guardian, 28 May 2014). How would supporters of the EU in the workers’ movement respond? By urging workers to accept ‘EU rules’? An appeal to the European Commission for ‘permission’ to save workers’ jobs? Or Lenin’s advice, not to be bound by treaties that the working class have no responsibility for? There is a danger in posing issues in such a way as to reinforce the idea that there are lasting solutions to the problems workers face within the confines of a nation state. Even public ownership under democratic working class control and management of large sections of one country’s economy – for example, in Greece today – would only be a first step towards breaking the power of hostile world capitalism. The struggle to overthrow capitalism and begin the transition to socialism will likely start on the national terrain of one country but of course it cannot end there. But the bigger danger is vacating the field to the right within the national terrain. The horrendous debt burdens placed on the workers of Greece and other countries after the crash of 2007-09 – policed in the eurozone by the EU institutions – are not incomparable, as a percentage of GDP, to the burdens imposed by the world war one ‘victors’ on the German working class and middle classes by the ‘war reparations debt’ clauses of the Versailles peace treaty. This sense of being ‘punished’ by the Entente powers of Britain and France was a feature of mass consciousness in Germany and needed to be taken into account by the workers’ movement. Writing in the early 1930s, before the victory of the Nazis in 1933, Leon Trotsky criticised the argument of the Stalinist leader of the German Communist Party (KPD) Ernst Thälmann that what was involved was "primarily a matter of national liberation" as Germany "is today a ball in the hands of the Entente". "France also, and even England", are ‘balls’ for the US, wrote Trotsky. "This is why the slogan of the Soviet United States of Europe, and not the single bare slogan, ‘Down with the Versailles peace’," is necessary (The Struggle Against Fascism in Germany, p102). But, Trotsky insisted, the working class cannot abandon the field to the nationalist right, as its mass organisations – the Social Democratic Party (SPD) and the KPD – did in December 1929 when a referendum was promoted by the German National People’s Party (DNVP – led by the media baron Alfred Hugenburg) to reject the Young Plan re-affirming German war reparation debts. The KPD abstained in the referendum while the SPD deputies voted for the Young Plan in the Reichstag, ‘in support of international law’. The Nazis participation with the DNVP in the referendum campaign – the first time an important section of the capitalists had collaborated with Hitler – was a factor in their phenomenal surge from 810,000 votes (2.6%) in the May 1928 general election to 6.3 million (18.2%) in September 1930, against the backdrop of the 1929 crash. Analysing the election results, Trotsky concluded that the working class had been given yet another "chance to put itself at the head of the nation as its leader". Its failure to do so, following the missed opportunities of the previous decade to show it could "change the fate of all its [the nation’s] classes, the petit-bourgeois included", was paving the way for a terrible reaction (ibid, p59). The Versailles treaty debts were, of course, backed up by external military force, with French troops invading the Ruhr in 1923. This is not the case with the EU treaties; although the ‘unattributed briefings’ by EU officials that Grexit would necessitate a ‘state of emergency’, invoking spectres in a country with experience of military coups, are an ominous warning of how internal reaction could be ‘legitimised’. Nevertheless, there is a danger that by referring to an ‘EU super-state’ as the Communist Party of Britain does, the actual power of the EU is exaggerated and workers demobilised in front of ‘EU law’, ‘there’s nothing you can do’ etc. On the contrary, the Lindsey workers smashed the posted workers directive and there was nothing the EU could do. If the employers had used EU law against the strikers, it would have been British legal officers acting under the jurisdiction of the then Labour government who would have prosecuted the case. In other words, it requires compliant representatives of big business ‘at home’ to allow ‘EU laws’ to be implemented. Once again the conclusion must be that the working class needs its own independent party to fight pro-capitalist politicians in Westminster as much as in Brussels. Some on the Yes to EU left have come up with what they think is a clever argument against the socialist position that the EU is a bosses’ club, by saying that ‘Britain is a bosses’ club too’. But they don’t realise that this makes the case for a No vote in the referendum. If socialists were asked, ‘do you support the economic, social and political relations of Britain today?’, should they really say Yes? And if socialists are correct to refuse to accept UK-made legislation to impose austerity on the working class – ‘agreements’ made amongst the political representatives of capitalism sitting in Westminster – why is it wrong to vote No to agreements amongst the political representatives of the different national capitalist classes of Europe – otherwise known as the EU – to impose austerity on the working class throughout the continent? The EU referendum, if it goes ahead, will be in essence a referendum on the British ruling class and its policies. For all the eurosceptic bluster of sections of the media, withdrawal from the EU is not the considered policy of the overwhelming majority of the British capitalists. Even the ‘pro-Atlanticist’ section, typified by Rupert Murdoch, who follow the US neo-conservatives in seeking to ‘disaggregate’ the EU, aim more at hampering the efforts of the different national capitalist classes of Europe to counter-balance US power through the EU, rather than to break it up entirely. After some suitable ‘renegotiation’ sound and fury by Cameron, Yes will be the position of all the main forces of capitalism, in Britain and internationally, from Obama to the Pope, via the CBI, the monarchy, the BBC… and the Labour Party and TUC leaders. For the majority of workers, however, it will not be primarily about what is on the referendum ballot paper but, eighteen months or more into ‘a government with no mandate’ – just 24% of the electorate voted for the Tories – a chance to express their rage at the capitalist political establishment, as the Scottish referendum became a mass revolt against austerity. Socialists must fight for those trade unions that can be moved, and young people and the anti-austerity movement, to participate in and try and give a direction to that revolt. Referendums are not the ‘normal’ method of struggle of the workers’ movement, compared to collective actions like demonstrations, strikes and occupations, or a workers’ party participating in an election. A referendum can be used to divert the working class movement but on other occasions it can be used by the movement to organise its forces and, at the same time, inflict a blow on the ruling class. During the Fifth Republic, French president Charles de Gaulle used referendums to mobilise the politically more conservative countryside against working class urban voters to consolidate his semi-dictatorial power. But it was his defeat in a referendum on secondary constitutional questions in 1969, a continuation through other outlets of the revolutionary upsurge of 1968, that led to his ousting. The working class must have its own No campaign in the EU referendum, presenting a socialist alternative to the bosses’ clubs of Britain and Europe. In the run-up to the 1975 referendum on Britain’s membership of the EEC, then more popularly called the Common Market, a Labour Party special conference supported a No vote by an almost two-to-one majority. Thirty-nine trade unions also had a No position. But as part of the process of the transformation of the Labour Party from being a ‘capitalist workers’ party’, with a leadership invariably reflecting the policy of the capitalist class but with a structure through which workers could move to challenge the leadership – and a socialistic ideological basis (Clause Four) – policy towards the EU began to shift. Tony Benn, for example, recorded policy debates on Labour’s national executive committee (NEC) in 1989 on exchange controls and workers’ votes on company takeovers, which were defeated by the right – with just four votes in favour – as "impossible because of our treaty obligations to the Common Market" (Diaries 1980-90, p563). One of those voting with Tony Benn was the Young Socialists’ NEC representative, Hannah Sell, now the Socialist Party’s deputy general secretary. Since then, with Labour completely committed to the capitalist market and the majority of union leaders clinging to the dream of a ‘social Europe’ of improved rights and renewed prosperity, there has been no working class political voice to articulate a clear alternative to support for the EU. That was why the 2009 No2EU challenge initiated by the RMT was an important development, followed in 2010 with the establishment of TUSC. But TUSC is still a ‘pre-formation’ on the road to a new workers’ party which, while nearly a third of a million votes have been cast for its candidates since 2010, still has a modest electoral record to date. If the unions were to launch a No campaign, TUSC could play a complementary role but it would not be the main vehicle for a workers’ No. The unions could stop the No campaign being dominated by the reactionary right. The legislation on referendums requires organisations that want to campaign – including political parties and trade unions – to register as a ‘permitted participant’ with the Electoral Commission. It also gives powers to the Commission to decide which ‘permitted participants’ become the ‘official’ Yes and No campaigns, eligible for substantial public funding, Freepost communications, referendum broadcasts and other media access. But the Electoral Commission is not obliged to designate any ‘permitted participant’ as the official campaign if there are competing claims. If even just the left-led unions came out for No and launched a campaign on the lines of ‘Who should be the voice of No? Trade unionists and socialists, or bankers, Tories and ex-Tories?’, they could compel the Electoral Commission not to hand public funds and media platforms to UKIP et al. Why should the ordination of reactionary pro-austerity politicians as the representatives of working class anti-austerity No voters be allowed to go unchallenged? But if no unions are prepared to launch a No campaign other than the RMT, since 2012 a constituent organisation of TUSC, then TUSC must step up to the plate. An opportunity was missed in 2014 when the Communist Party of Britain refused to join TUSC, with the full rights of a participating organisation, to contest the European elections and No2EU was temporarily re-established instead. That must not happen again. Building TUSC’s profile, in the unions and in all ballot box contests including referendums, is vital preparatory work for the future formation of a mass party that could unite together trade unionists, unorganised workers, socialists, young people, oppressed groups and community campaigners, in the struggle for socialism in Britain and in Europe.